William Thomas was born on December 27, 1819, in St-Benoît, Deux-Montagnes County, in Québec. His parents were Walter Thomas, of Wales, Great-Britain, and Marguerite Paradis, a French-Canadian. They were married in the Anglican Church, in Lachine, Québec, on October 26, 1818. A Walter Thomas emigrated to Nova Scotia in 1818. It might be him. William Thomas was the first born. I found eight siblings so far. All were baptized in the Catholic Church, except one for which I do not have a birth date.The family mainly lived in St-Benoît, Ste-Scholastique, Rigaud and St-André d’Argenteuil, in Québec. 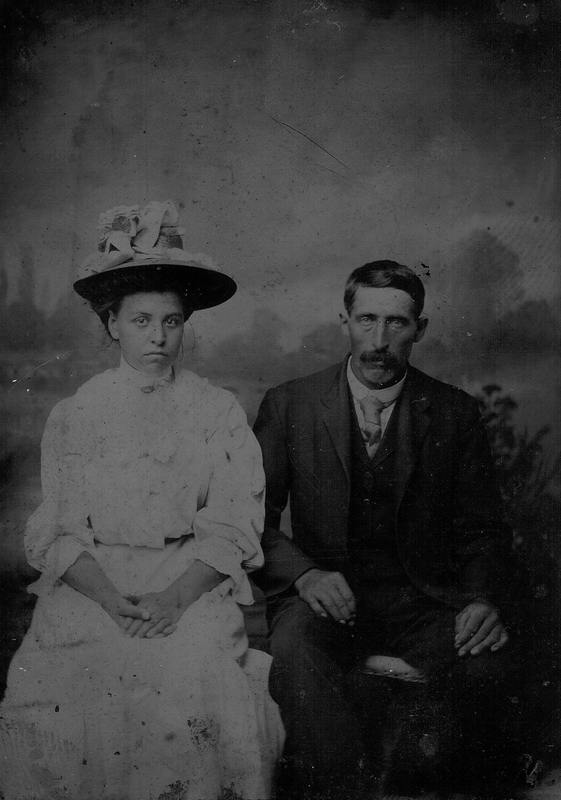 William’s parents, Walter and Marguerite, later moved to Franklin County, NY. They appear in the 1840 US Census for Westville and the 1850 US Census for Constable. Walter died between 1875 and 1880 and Marguerite, between 1870 and 1875. Both were living in Westville at the time. Before 1842, William Thomas married Ann (Todd? ), probably in Canada. It looks like they moved to Franklin County, NY in the early 1850’s. The 1900 US Census indicates 1851 as the year of arrival for William although one child was supposedly born in Canada in 1852. William and Ann are listed in the 1860 US Census in Constable, NY. The first child to be born in NY state was born in 1853. I have been told that Ann’s surname was Todd but I haven’t found any proof yet. I will have to make further research on her. Peter Thomas, William’s brother, did marry a Christiana Todd, in 1861. She might be Ann’s younger sister. Her parents were Thomas Todd and her mother was called Anna. Ann was born abt 1822 in Canada. She died on November 1, 1864 in Westville, NY at age 42. She was buried in the local Briggs Street Cemetery. William’s remains would later be buried in the same plot. In early 1865, William Thomas married Julia Tourville. A post have been published for her, you can read it here. Since his arrival, William Thomas was farming in Franklin County. More research will have to be done in Franklin County on land records for William Thomas. 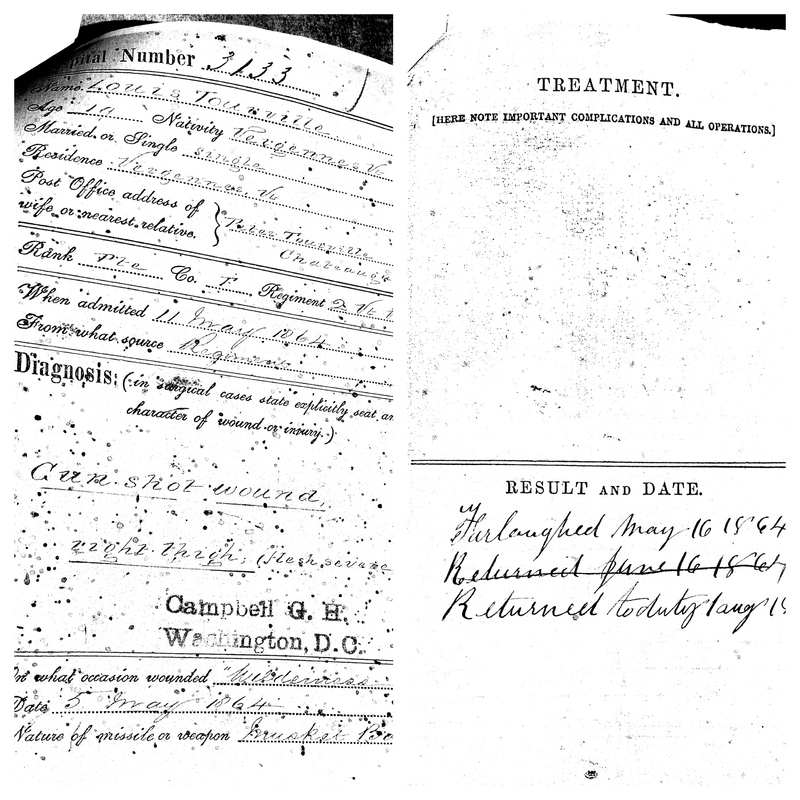 Another area of research includes the naturalization records as the 1900 US Census indicates that William was naturalized. I haven’t found any obituaries for William Thomas. He died on July 15, 1901, at age 81 and was buried in Briggs Street Cemetery, in Westville, with his first wife Ann. And last, here is a picture of Julia and William, his second wife. Would this be a picture at the time of their wedding? She was 22 and quite pretty, he was 45. Charles Tourville and Sophie Arpajou had eight children who made it to adulthood, four sons and four daughters. Let’s continue with one of their daughters, Julia Tourville, born in Vermont in October 1843. I do not have an exact birth date for Julia. The 1900 US Census indicates that she was born in October 1843 which makes sense as a document dated October 20, 1851 gives her age as 8, so she would be born in early October 1843. The other censuses confirm that information as well, except for the 1850 and 1860 Census. In 1860, Julia was 17 years and was working as a servant in a hotel in Chateaugay, NY. She probably married William Thomas, a widower who lost his first wife Ann on November 1, 1864, in early 1865 as she gave birth to their first son on December 24, 1865. It is the only child for William and Julia for whom I found a Catholic baptism. According to the 1900 US Census, Julia had seven children, six of them still living in 1900. Probably one died in infancy as I only found six children for William and Julia. They lived all their lives in Franklin County, New York. According to the censuses, William and Julia lived in Constable, NY, after moving from Fort Covington, at least until 1880. In 1900, they were living in Brandon, NY, more precisely in Skerry, on a farm. William Thomas died on July 15, 1901 and was buried in Briggs Street Cemetery, in Westville, with his first wife Ann. I looked for years to find Julia after William’s death and a relative of the Thomas family had found some newspaper articles solving the mystery. On August 19, 1908, The Malone Farmer, reported that Julia was quite ill. Fortunately, some ten day later, she was doing much better. Is it because of her health problem that the couple decided at the end of that year to sell the farm or “William Thomas Place” as the newspaper called it, to Henry Larock of Vermont? It seems that they decide to live in Joel’s house in Skerry as in January 1910, they moved from there to their farm in Dickinson where they received visitors like their grandchildren in 1913. They apparently later moved to Brushton as Joel’s son, John Davenport, from New Hamspshire, visited the couple in 1914. With these articles, I have lots of work to do! First of all, William Thomas had a farm, maybe more than one, so I should check the land record index of Franklin County, either in Malone, NY or on my next trip to Salt Lake City. It’s lucky for me they lived all their lives in Franklin County. Second, I would like to find the obituaries of her children, I might find out more details. And last, here is a picture of Julia and William, her first husband. Would this be a picture at the time of their wedding? She was 22 and quite pretty, he was 45. Her second husband, Joel H. Davenport, died in 1920 in Massachusetts, while visiting his niece. I haven’t found his burial place yet. 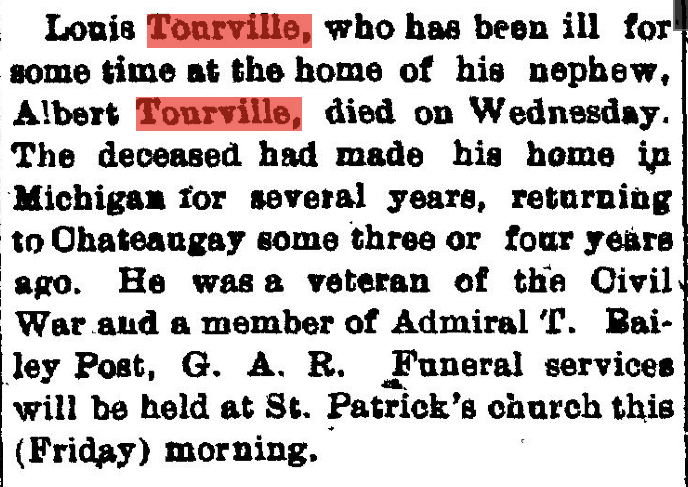 You might be interested in Julia Tourville’s first husband, William Thomas, as well. He was also featured in a post here.